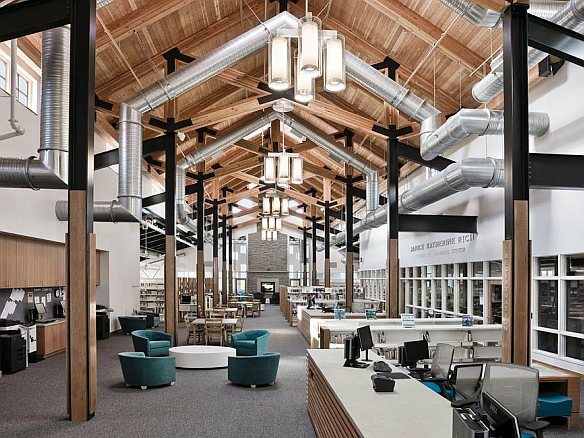 The new 25,000 square foot Sugar Grove Public Library, designed by Cordogan Clark and Associates,in association with Leo A Daly, replaces the 6,000 square foot building that had housed the library for 37 years. The new Sugar Grove library celebrates the future as well as the past, blending a regional agrarian aesthetic with state-of-the-art technology. It provides a place where people want to be:"I love being here, night or day, inside or out. The building is never the same, the light and sounds are ever changing throughout the day" its Director Beverly Holmes Hughes says. The new library is planned to serve the needs of the Sugar Grove, Montgomery, and North Aurora communities that comprise the Library District for at least the next 10 to 15 years. It provides for collection growth in all areas. The site also provides room for an additional 35,000 square feet of expansion if ever needed in the future. The architectural design of the Library celebrates Sugar Grove’s agrarian heritage. This heritage is alive and evident in the numerous working farms that surround the area. The overall form of the library evokes barns and farmhouses. Siding, rusticated cast stone, timber trusses, and wood roof decking reinforce this aesthetic. Yet this facility is as much about the future as the past. The library features state-ofthe- art technology throughout, from the widespread availability of wireless access to theater- quality media equipment in the flexible meeting rooms, to the 18-station Janice Katherine Rich Technology Learning Center. "The WiFi is popular" notes Library Director Beverly Holmes Hughes, "and people are finding their cozy study place all throughout the building." The new library is in a developing town center that includes other civic functions and commercial development to the north and residential development to the south and west. The building is sited for compatibility with neighboring uses: The monumental north elevation abuts municipal and commercial properties. Lower-scale quiet reading and small study rooms, and an allweather porch are located at the south end of the building, in deference to the smaller scale residences planned towards the south. The covered front porch provides a sheltered entrance for those approaching from the south. It is also reminiscent of the Bliss House, one of the oldest buildings in Sugar Grove, and a local landmark. The dramatic interior recalls traditional high-bay library reading rooms. Skylights and clerestory windows provide generous natural light, reducing the need for artificial light during the day. In fact, Library staff members say the new building offers better illumination with the lights off, than the old building did with all of the lights on. It also dramatically expresses its structure, a focal design feature of the main reading space. Exposed steel columns, timber trusses and wood roof decking reinforce the agrarian aesthetic and are decorative elements in their own right. The large north window wall highlights the wideopen Youth Services reading area. The Quiet Reading Room and fireplace round out the south end: its semi-circular silo shape highlights the exterior. A playful variety of window sizes and placements evoke the sense that changes have occurred to the "silo" over time. Just inside the library doors, the Book Nook Café offers traditional café drinks along with a creative seasonal menu that make it both a popular library amenity and a destination in its own right. For other libraries planning a similar amenity, Director Holmes Hughes is a booster: "The Book Nook Café is showing a profit for the library, some days I wish they had more space, already!" During the planning and design phase, Library District residents envisioned a new library that would not only house books and other media, but would become a center for education, entertainment, and cultural enrichment. The library has become a community center in its own right: "Our Large Meeting Room spaces and Board Room have registered 85 bookings between August and December of this year," says Director Holmes Hughes. The new library has in many ways exceeded expectations. Library circulation has increased more than 20 percent since the new building opened this summer, as have the number of cardholders. Says Library Director Holmes Hughes, "Patrons continue to come back with neighbors, friends, and family in tow for a tour. We have to ask people to leave at closing on most days. Even as we close, people try to come in."